Every year I have quite the supply of radishes at the beginning of summer. It’s the first thing that will sprout in the garden and I tend to get a little overzealous tucking radish seeds into every spare nook and cranny. I like radishes in my salads, but after a while, I really have to find something to do with the huge supply, especially when they’re getting large and overgrown in the garden because I can’t use them up fast enough. When in doubt, pickle. That seems to be my mantra in the garden this year. Pickle or can everything in sight, so it can be enjoyed later in the year, when the best days of my garden are behind me for the season. My tomatoes are just starting to come in, but I’m already looking forward to making tomato jam and paste to put away for fall when I’m lamenting the all-too-short tomato season. With the radishes I decided that rather than canning, I would whip up a quick brine and keep a jar of pickled radishes tucked in the fridge for a week (that’s about as long they will last without canning or preservatives) for intermittent snacking. We ended up devouring most of these during a BBQ with friends. They were great on burgers as well as on their own on the side. If you have a favorite brine recipe, by all means use it and please share it with us! In a pinch you can even use a pre-packaged jar of brining spices. Though I prefer to make my own concoction of mainly mustard and coriander seeds, I was out of both and not wanting to run to the store, I settled for a pre-made blend I had at home. I recommend taking the time to go through and pick out come of the cloves and anything else you’d rather not include. The cloves would have overwhelmed the flavor of this batch of pickles. *The amount of radishes is intentionally not precise – at the end of the process, you will simply pour over enough brining liquid to cover what you have. Rinse the radishes and slice thinly using a mandoline and set aside. Combine the next seven ingredients in a saucepan and bring barely to a simmer over medium heat, stirring to dissolve the sugar and salt. Remove the mixture from the heat and allow to cool slightly (for about 10 minutes). 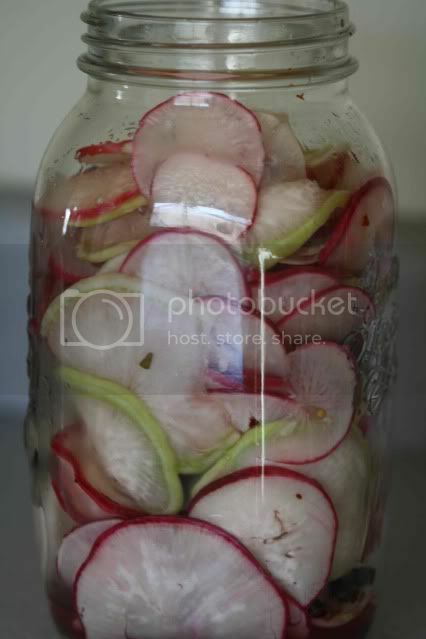 Place the radishes in a jar and pour in enough brining liquid to cover. Discard remaining liquid. Place the jar of radishes in the refrigerator and let sit for a day (if you can wait that long). These pickles will last about a week in the refrigerator. Beautiful photographs! The pickled radishes sound wonderful. I wish that I enjoyed pickling any vegetables other than well, pickles (er...cucumbers), but I think a trip to Japan in my teen years and a few too many over-pickled foods (like plums! gross!) kinda killed that for me. Your photography is so pretty! What gorgeous photography. I've never had pickled radish. There's no time like the present to try. What a lovely idea!! i so love this recipe!!! I love radishes but have never had them pickled. I will have to try this for myself. I've been meaning to try pickling but it makes me nervous for some reason. If I wanted to pickle something other than radishes, would you suggest making any changes to the recipe, or does this work for all veggies? 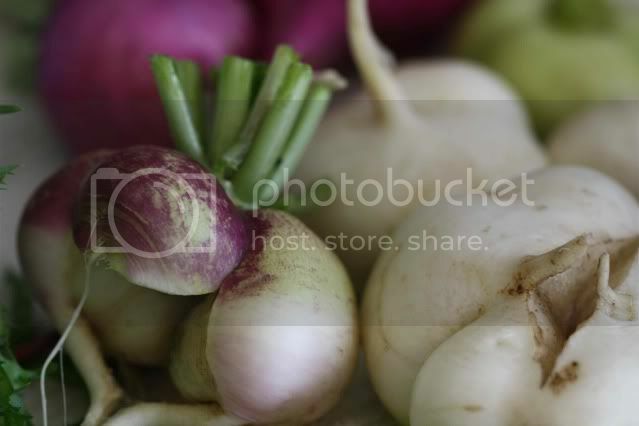 Looks wonderful gorgeous photos of the radish. 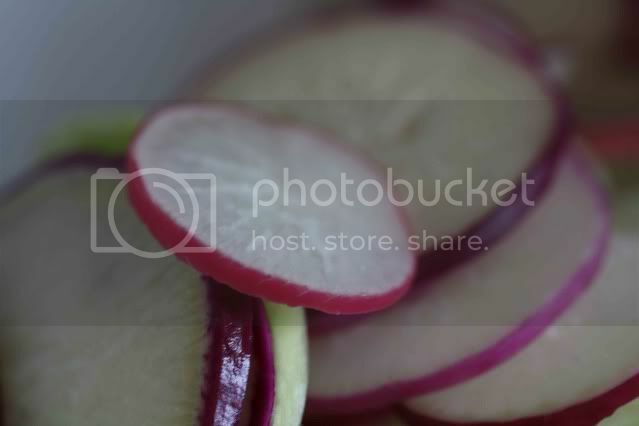 I pickled some radishes for the first time last fall, and they became my favorite thing to eat! I'm looking forward to more pickling. What a great idea! Thanks for the tip and idea! Pickling them must bring out th best in radishes. Tanvi - this will definitely work for other veggies as well. I encourage you to do a google search for brining liquid and see what recipes come up. Look for the flavors that interest you and come up with your own combination. Once you get hooked you'll be pickling everything in sight! Have fun! As I am known as the Radish, this is a lovely post. You have very good recipes. I missed you in your absence. These sound delicious! I would love to can them and have them in the winter. How would I modify this recipe to do that? Actually, there are so many recipes I would love change to make last all winter. (Am trying to get ahead with Christmas presents already!) I'm fairly new to canning and don't quite trust myself enough to start playing around, as I don't want the stuff to spoil. Is it possible, or does the recipe need to be specifically designed for canning? I love growing radishes in my own garden. It's nice to have something foolproof and delicious in early spring. 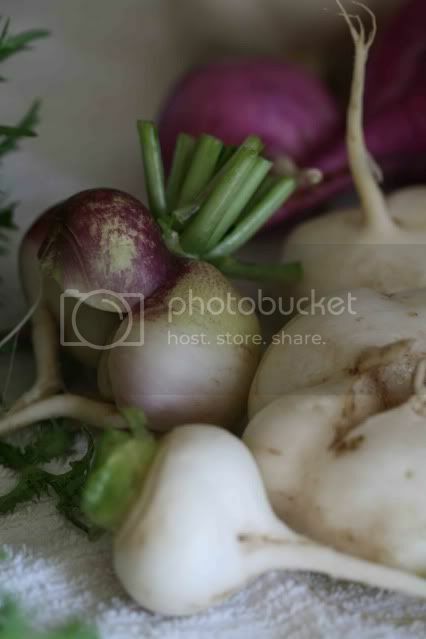 It looks like you have an impressive blend of radish varieties. And what a delightful recipe!